There are so many fun and exciting things to do in Estes Park on your next visit! Chief among them exploring the great outdoors, with easy access to Roosevelt National Forest and Rocky Mountain National Park. Both practically in your vacation rental home’s backyard, the adventures to be had are endless. Hiking, biking, and horseback riding are a few of the popular activities in the area that offer not only exercise and exploration but jaw-dropping 360 mountaintop views. However don’t feel you have to leave your rental to enjoy the great outdoors. 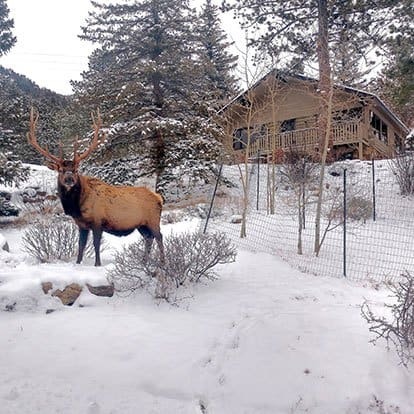 Many of our homes have panoramic views of the valley and surrounding mountains and wildlife encounters are not uncommon, just hang out on your back porch to experience Colorado living! More information on all the fun and exciting things to do in Estes Park are highlighted in Windcliff’s guide — we hope this helps you make your Colorado vacation a memory to last a lifetime. Ready to book your vacation rental? Search Windcliff’s rental homes to find the perfect fit. We can’t wait to meet you! 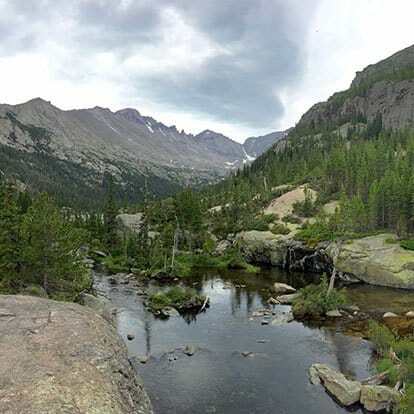 Rocky Mountain National Park has over 350 miles of hiking trails, with countless opportunities to see nature in all its glory while exploring the mountains. This should be one of the many highlights of your Estes Park vacation! As you’re surrounded by the beautiful mountain countryside, opportunities to view wildlife are in no short supply. Some animals are easily spotted and others are more elusive, but no matter what — this is the place to immerse yourself in nature. Outdoor experiences are at the core of any Estes Park vacation, and you’ll have the chance to raft, go fly fishing, or even head off-road in a Jeep! Can you imagine better than exploring the mountains of the West the way it was originally done… on horseback? Estes Park is an extremely popular place for horseback riding, with a variety of options for every rider and experience level. Family is at the heart of what we do at Windcliff Vacation Homes. There’s countless ways to make memories with your loved ones here, whether it’s going to one of the local amusement parks, flying high on a zipline, or even attending an educational seminar to discover the area. Fancy a cold beer or a fine cocktail to wind down your day of adventure? Fortunately, Estes Park is home to beloved local hangouts, a true beer garden, and two of the best microbreweries in Colorado. Estes Park is only 90 minutes from Denver, Colorado. Nestled at the east entrance to Rocky Mountain National Park and surrounded by protected land, this mountain village offers travelers the best of outdoor recreation, real wildlife, and hometown hospitality. Family vacations include pristine wilderness and adventure, alongside signature sweets and fun activities. Getaways span from group hikes to local wine tastings & spa treatments. Romantic getaways start with off-road exploration & end next to roaring fireplaces with gourmet plates. Truly the best of both parks – Rocky Mountain National Park and Estes Park are true Colorado gems. Visit the convenient and friendly Estes Park Visitor Center, which is located right along the bike trails east of the downtown area, for information from helpful local volunteers! Or, if you’re looking to kickstart your mountain vacation, you can search our available Estes Park rental luxury homes and condos, or give us a call at 970-586-2181!